If you want to send a sales letter to get new customers, you have several options. Transcribe every word you said. Edit for clarity. Congratulations. You now have the makings of a pretty good sales letter. Your letter won't be as good as something written by a professional copywriter, but it will probably be better than anything you've mailed before. Because a sales letter is simply words that sell on paper. Option #2: Invest a few bucks to hire a professional copywriter. When I say "invest," I mean it. Because once you have a sales letter that works, it's like owning a printing press that prints dollar bills. Look for a copywriter with at least 10 years of experience in direct-response marketing, who offers a money-back guarantee. That way, there's no risk for you in hiring him or her. Option #3: The option I describe in the video above. Add a handwritten thank-you note to whatever else you're doing, and watch your sales soar. And if you want to put an end to "feast-or-famine" syndrome in your business, my free Client Cloning Kit can help. Grab your copy here, while they last. Pop Quiz: Which has a more appealing message, your business or a box of bran cereal? An ordinary marketer would say this about their cereal, "We use natural bran fiber." And this is exactly what most businesses say about themselves: "Here's what we do. You figure out the value." But Grain Berry is extraordinary (see their box at left). They say, "A key ingredient we use ... is Grain Berry Bran. This remarkable bran is a fiber that has the added benefit of being a powerhouse of all natural antioxidants." Then, they take it a step further and tell me what that means: "Grain Berry means great taste, dietary fiber and powerful antioxidants. We guarantee your satisfaction or your money back." These guys take a few extra sentences to tell me the value of what they do ... and I"m sold as a result. But more than that, Grain Berry knows their customers -- and how to appeal to them. Because anyone who buys natural cereal will be interested in fiber and antioxidants (taste, too). That appeals to me. Plus, guaranteeing satisfaction or my money back is smart. It removes the risks if I'm a first-time customer ... which will result in more first-time customers. You should study the rest of the copy, "What does ORAC Value Mean." It's just as appealing and delivers more reasons why I should buy this cereal. But for now, here's an easy way to make your web site, business card, sales letter, postcard, or social media profile instantly more compelling -- and extraordinary. Do this: Rewrite this section from the cereal box: "____ means ___, ___ and _____. We guarantee your satisfaction or your money back." "ABC Mechanical means fast service, friendly repair technicians and no-surprise pricing. We guarantee your satisfaction or your money back." "XYZ Technology means worry-free IT support, 100% security and a partner you can trust. We guarantee your satisfaction or your money back." Take a few minutes today to tell prospects the value of what you do -- and guarantee what you do. It's a simple way to make your marketing extraordinary. And boost your sales, too. Meanwhile, if you want to put an end to "feast-or-famine" syndrome in your business, my free Client Cloning Kit can help. Grab your Free Kit here, while they last. Huge growth is made of small gains -- so small, they may seem trivial. Example: By adding just $10 a day, every day, to your business, it can add up to $300,000 in revenue per year. I know this for a fact, because I've done it twice. The notion of turning $10 a day into $300,000 a year is closely related to financial guru Dave Ramsey's idea of the "debt snowball." Then, use the payments you made on your first debt to pay off your second debt. With each debt you pay off, your “snowball” of money rolls and grows faster. Momentum builds -- and all your debts are paid off. First, find one source of revenue that reliably and automatically delivers an average of $10 per day. It can be a small source ($10 a day) or a bigger source ($300 a month). Both work out to $10/day. Example: If you add an upsell feature to your shopping and it produces 2 sales every month at $150 per sale, congratulations! You've just added an automatic source of $10 a day. If you add one new source of $10/day every day, Monday through Friday, you add $200/day to your business in 4 weeks (do the math and see). And after 17 weeks, you've added $850 a day in new revenues. You can stop there, if you'd like. Because $850/day x 365 days = $310,250 a year. And that's where I got, not once but twice, following this same simple program for one of my businesses. In my case, I got most of that revenue by adding 3-5 new ads in Google AdWords every day for 6 months. Individually, they brought in maybe $2-5 a day in revenue ... but together, those ads brought in more than $2.1 million in just under 5 years for me. All on auto-pilot, while I did other things. Now, admittedly, there's a LOT more competition these days on Google AdWords than there was when I hit it big with this idea back in 2005. But the principles still work. If you attract just one new joint-venture partner every day who's worth $10/day to you, you win. If you delight just one client every day who refers business worth $10/day to you, you win. And here's a pro tip: If you carve out just one hour a day for this, you'll see progress. Plus, your diligent efforts will inevitably dig up revenue streams worth $20/day ... $100/day ... maybe more. So you can afford to goof off for a few days if you'd like, after you hit your daily quota. But beware -- goofing off is how I got off track. When Google is bringing you $2,000 or $3,000 a day in revenue automatically, as it did for me, it's easy to fall into bad habits. That's what I did. And the Google Gravy Train went off the tracks for me after about 5 years. But never again. I learned my lesson ... and set up a system of "checks and balances" to keep me disciplined, even when I don't feel like it. This "10-300 Plan" is simple, but it takes effort. Some days, you'll be able to find a $10/day revenue stream in about 10 seconds. Other days, you may not find any. That's okay. Just find 2 the next day. You can add 85 new revenue streams to your business, one day at a time, Mon.-Fri., over 17 weeks. And those little income streams will add up to $310,250 a year. Now, before you scoff at this idea, how many revenue streams did you add last year? Three? Five? NONE? So, why not give this "10-300 Plan" plan a try for just 30 days and see what happens? Can Your Ezine Do This? Now. You may sneer and say, "Heh! See what happens when you mail a newsletter? The Postal Service mangles it." Well, yes, there is that. But ... when your ezine arrives in readers' email in-box, is it an event? Do they say, "Huzzah! Another ezine. Let me clear out 5 minutes from my schedule and read every word!" Not likely. In survey after survey, people complain about getting too much email. About this over-reliance on email, business professor Gregory Northcraft says: “Technology has made us much more efficient, but much less effective.” And I agree. Now, contrast email with direct mail. Every person who gets direct mail -- which is all of us -- carves out at least 5-10 minutes a day to read it. And if your direct-mail letter gets to them and gets opened, it will get read. At that point, you have your reader's complete attention. Huzzah. Do your ezine readers email you on a Saturday to start a fun conversation? That's how I got the picture above. My subscriber wrote: "Thought you would enjoy seeing how the Postal Service treats your mail." Yes, the Postal Service did fold, spindle, AND mutilate my newsletter ... which would seen like a loss. But because my newsletter did not arrive intact, as it usually does each month, my reader wrote to let me know. This tells me that my newsletter is important (at least to this reader). And our relationship is now a little bit stronger as a result of our email discussion about the virtues of the U.S. Postal Service (which I will spare you here). So this incident is a win for me. Bottom line: Your email newsletter may be more efficient than a printed newsletter, but is it more effective? And if you want to put an end to "feast-or-famine" syndrome in your business, my free Client Cloning Kit can help. Grab your Free Kit here, while they last. Today's guest blog post is from Dr. Glenn Pickering. If you want to get more done in business, you need to subtract two things from your life. At first glance, these two behaviors may seem like opposites, since one involves inaction and the other involves too much action. Yet, both have much in common -- both are thoughtless, vision-less, and fear-driven. Whether I avoid taking bold action by doing nothing or by busily occupying myself with mundane daily tasks, the result is the same -- more of the same, the status quo. So, how do you subtract procrastination and busyness from your life? Let’s start with procrastination. Here’s the key. The way to get something done is to start. Not to finish -- to start. Often, if I find myself procrastinating, it is because I am honestly confused as to how to proceed, because I can’t see the whole picture. At times like that, I have found it helpful to simply start somewhere. Almost always, once I have taken the first step, the next step becomes clearer and the finish line gradually begins to come into focus. How about busyness? To stop frittering away your days in pointless activity, make an honest assessment of the tasks you are avoiding. In general, you will find that these tasks fall into two groups: things you’re uncomfortable doing and things you don’t do well. To deal with “uncomfortable” tasks, you may need to put one of those at the top of your to-do list tomorrow, enlist the aid of an accountability partner, pray/relax/meditate to make yourself less anxious, or recall previous successes, as a way to remind yourself that you can indeed tackle this. To deal with things you’re not good at, you may need to improve your delegating skills, ask for help, acknowledge your struggles to others, or ask for suggestions. We need to admit that there are certain things that we will never be good at and then allow others to do them, help us with them, or guide us though them. By subtracting procrastination and busyness from your life, you make room for more productivity -- and more happiness. How Do I Get My Emails Opened and Read? Want to get your emails opened and read? Then, if you want to put an end to "feast-or-famine" syndrome in your business, my free Client Cloning Kit can help. Grab your Free Kit here, while they last. If you answered "Yes" at all, you really meant NO. That's because what you really hate is how bad you feel when people reject you. When it comes to building your business, "we hate the feeling that we may experience if we don't get the positive outcome that we're looking for," according to author and coach John Assaraf. Assaraf tells of a mentor handing him a sheet of paper when he first started in real estate sales. That paper had 100 boxes on it; within each box was the figure $15. Assaraf was told, "Every time you speak to someone when you're prospecting and they say, 'No,' you just made 15 bucks. Can you live with that?" The rationale was this: To make a sale and earn a $1,500 commission required about 100 conversations with prospects. And it worked. Brilliantly. Assaraf says he started to associate making calls with earning $15 per conversation. He re-framed selling so that he no longer took rejection personally. As a result, he felt better about prospecting ... he made more calls ... made more sales -- and earned a ton of money. So, why not try this yourself and re-frame your marketing and sales? 2) Determine how many contacts you need to make a sale. Let's say, 30 emails, conversations or other touches. 3) Divide your average sale by required contacts. So, $3,000 divided by 30 = $100. This number is how much every "No" is worth, because each "No" brings you closer to the one "Yes" you need for a sale. 4) Now, for extra motivation, create a spreadsheet with 30 boxes, each of which has $100 inside. Print it, check off a box every time you hear "No" ... and see what happens. 1) The list. Who are you selling to? 2) The offer. What are you giving in exchange for money? 3) The copy. How are you saying it? With the right list and the right offer, the copy largely takes care of itself. Case in point: The sign at left, which I took a picture of in Cub Foods. They're selling this freezer to people in their grocery store. Obviously, that's a good list -- people with the money and desire to buy food. But what about the offer? 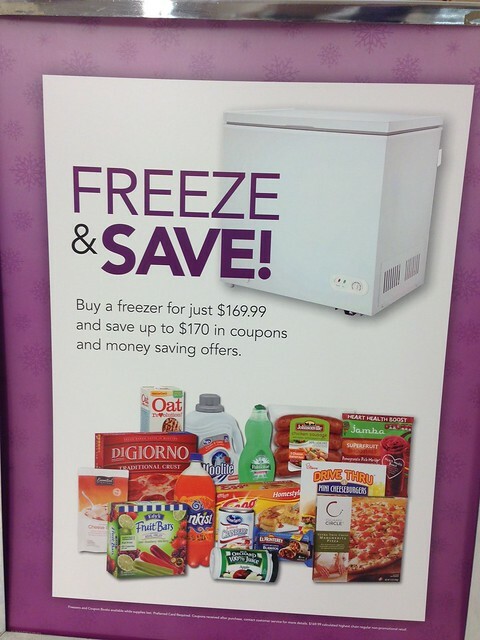 ... but I think Cub Foods pulls it off with this offer: You get a freezer and $170 in free stuff in exchange for $169.99. That price is no accident. By charging 1 penny less than the value of the coupons they offer -- on top of the value of the freezer itself -- Cub Foods is making it very clear that you're getting the better end of the bargain. That makes for a pretty powerful offer. And the copy largely takes care of itself. So, take this as an example of how to construct a powerful offer. Make it clear that buyers are getting more in value than they're paying you in dollars ... and you'll get more buyers.